My mother-in-law recently received the Amazon Kindle for a birthday gift. I had heard about these nifty little devices, but never had one in my hands before and man was I impressed. If you love to read and ever get a chance to check one out, I highly recommend it. Or better yet, buy one for yourself or someone special on your gift list. It's the perfect gift for the party planner. There are currently over 4000 books having to do with cooking, food and wine and over 1500 books just on parties! Most are under $10.00 and are delivered instantaneously via a wireless connection that works much like a cell phone. Picture yourself or a friend using the Kindle in a kitchen with a favorite recipe from a favorite cookbook showing on the screen. Super easy to refer to when you are cooking. I don't have one myself. YET. But if I did, that's how I'd be using it! Size - I was really surprised at how light it is. You could easily carry it in a purse or briefcase because it is about the size of a paperback book. For Older Folks (and some of us younger folks!) - It has two nice features. One is the "Text to Speech" feature where Kindle can read newspapers, magazines, blogs, and books out loud to you. This feature is not available on all books but on a good number of them which is really nice for people who have difficulty seeing, like my mother-in-law. The second feature is really nice for her too and that's the "Increase Font" feature. The books can be read in HUGE font. Ease of Use - Once you get the hang of it, the execution buttons, like Page Forward, are easy to navigate. I wish the keypad buttons were bigger because searching for books requires typing, and that took some concentration, but the keys are bigger than most cell phone buttons so if you're into texting, managing the Kindle should not be a problem. Sign Up and Purchasing Process - Once you own the device, set up is very easy. First you have to open an account on line at Amazon. Here you will specify a password and input charge card information which is how you will be billed once you start purchasing books. My daughter handled the set up for my mother-in-law because she isn't too savvy on the computer. Now all she has to do when she buys a book is find one she likes and hit the Buy button. I didn't have a lot of time to play with it so if you want to learn more about how others review Kindle, click on the link and read more about the Kindle. For$189, it's a reasonable price for an exceptional gift. Our Kindle Giveaway was a huge success. We ended up with 69 entries and drew our lucky winner from a hat. The winner is Kathy Prahl and she contributed Hot Potato Bags, a very fun game that would be perfect for any theme party. Kathy lives in Missouri and is a frequent Theme Party Queen visitor saying "I have enjoyed your web site and from time to time go to it for ideas as we open up our home often for gatherings." She is also an avid reader who will make great use of her new Kindle which she will be receiving soon. Congratulations Kathy! We are always looking for visitor-submitted party ideas so I said to myself, "Self, what if you held a contest to encourage visitors to submit their ideas? And what if in exchange for every idea submitted the visitor's name was entered into a drawing? And what if the prize was an Amazon Kindle!" This conversation with myself ended with me writing this page about the contest. What an easy way for you to win this very popular electronic reading device. All you have to do is spend a few minutes submitting an idea in one or both of the following categories. Tell us about a game you played at a party you either attended or hosted. We are not talking about board games here but games that can be played with a large number of people like this entry for "The ABC Animal Game" or this twist on "Name that Tune." Enter your submission for Theme Party Games here. Photos are appreciated. What fun things have you done with your girlfriends either at home or out on the town? We already have some great submissions but are looking for several more. Read what other visitors have said and add your Ladies Night Fun submission here. The best submissions include a photo. Very Important: Remember to include your email address when making each submission. I will not be able to enter your name if I have no way to contact you if you win. After you hit the "Submit" button you will be asked if you want to receive notifications. Check "Yes" then enter your email address. Each entry will be posted on the Theme-Party-Queen.com website and your email address will be entered into the drawing. For each submission your email address will be entered. The more submissions you make, the more times your email address will be entered into the drawing. The drawing will take place soon afterwards and the winner will be notified via email, and if acceptable, will be announced on the website. If you are not already receiving our newsletter and you want to stay up to date on this contest, please join our newsletter here. A side benefit is that you will also gain access to several free party ebooks including, "Party Recipes and Bunco Scorecards" and "Wine Party Essentials." Visitors can enter as many submissions as they want. For each submission with a relevant photo(s), your email address will be entered into the drawing two times. You will definitely have an advantage if you include photos! Seems like a no-brainer to me. Spend a few minutes of your valuable time and you just might win a $189 Amazon Kindle for you are someone you love. 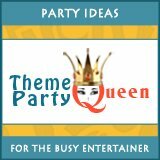 And your fellow Theme-Party-Queen.com visitors get to enjoy your entry!